As a child, I called small, very dark blue iris Dutch Iris. You don't have that name listed. Is there another name I might try? Thanks. 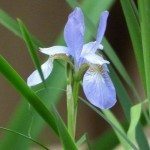 Here is a link with information about Dutch Iris.